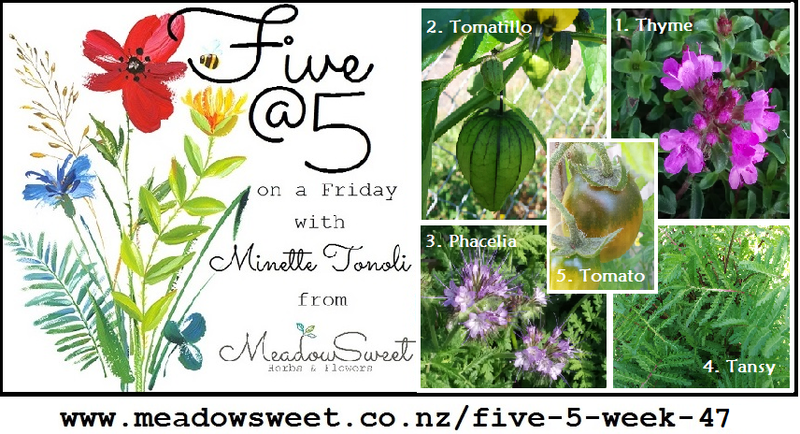 Welcome to the Week 47 edition of Five at 5. This week I’m super excited about some of my heirloom tomato plants that are fruiting, and even starting to ripen with colour! I also look at a creeping Thyme in my cottage garden which makes a groundcover around my stepping stones, the Tomatillo that are making beautiful Chinese-lantern like fruit at the moment, and two different tansy plants that are looking fabulous – common tansy and lacy tansy. Enjoy! From mid-spring through most of summer, the carpet of deep green that grow around some of my cottage garden pathway, erupts with bright pink blooms – much to my delight and that of the bees! This beautiful creeping thyme is easy to grow, and spreads relatively fast when its in a prime spot. You can use it just like common thyme – the leaves being a great addition to soups, stews, Mediterranean herb mixes, and it goes particularly well with zucchini, onions, and beetroot. Medicinally, the leaves are also used like common thyme, they are strongly antiseptic and disinfectant. A gargle of thyme helps with sore throats and mouth sores, while a thyme tea can help with colds and flu. You can grow this thyme from seed although the seed is not readily available, and because the genus of thyme naturally hybridizes easily, it is often better to get divisions or cuttings from an existing plant. Use creeping thyme as a border plant or let it spill over in containers, it looks great in rock gardens, or grown as a ground cover. Preferring a full sun position, it tolerates drought and requires a sandy soil. It makes a good plant for between paving stones as it tolerates light treading. It is perennial, and once established should be a beautiful permanent plant in your garden. 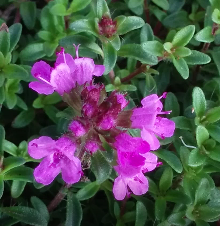 Just be wary of wet winters like we get in Auckland- no thyme does well sitting in cold and wet soil for prolonged periods… To overcome this, take a cutting or division in late autumn and cultivate in a pot in case you need to re-establish your plant after winter. You can also add gravel around the edges of your thyme plants to mitigate the effects of water-logging. Plant your creeping thyme in a hanging basket with other bee-attracting flowers such as chamomile, calendula, alyssum, nasturtium, or even with other Mediterranean edible herbs that are noted for flowers that attract wildlife – sage, rosemary and oregano. 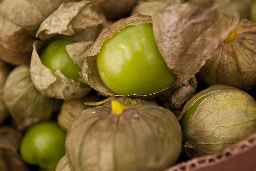 Tomatillo means little tomato, and indeed, the fruit of these plants were, just like tomatoes, an important food for Mayan and Aztecs, and today still play an important part in Mexican cuisine. With their tart flavour, and firmer-than-tomato flesh, they are delicious in sauces, stews, curries or eaten fresh in salads. High in pectin, they make delicious jams and jellies too. Tomatillo is a key ingredient in a true and proper salsa verde. <<<PLEASE NOTE>>> All parts of the plant, except for the ripe berries are noted as poisonous. Tomatillo is also known as green tomato, or Mexican husk tomato, and is an annual plant that can reach up to a meter in height. They have a naturally sprawling habit, but can be contained with grow cages or stakes. Tomatillo can be started from seeds, and their cultivation requirement is more or less the same as that of tomatoes – doing well in warmer climates, planted in rich and light soils that are kept evenly moist, and preferring a sunny position. Many cultivars exist, from green fruiting, to golden, and even purple ones. The latter being slightly sweeter when fully ripe. It is important to grow more than one tomatillo to ensure a good fruit set as the plants do better with cross pollination. Add all the other ingredients and pulse until well combined. 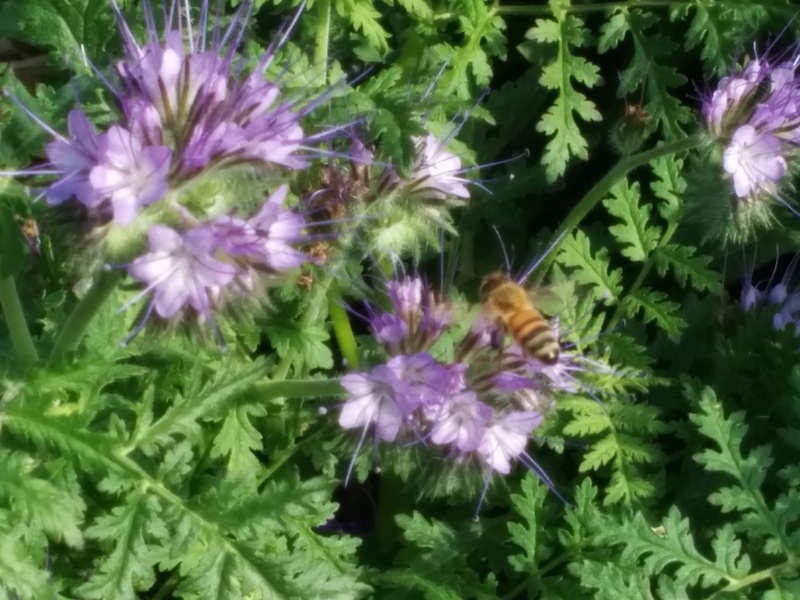 Beautiful lacy tansy, or phacelia, is flowering now in my pollinator beds, and I’m overjoyed with how well it works as a bee and bumblebee attracting plant, and how absolutely gorgeous it looks in full flower! The Americans know it as Fiddleneck because of the shape of the flowerheads. The clusters of lavender-blue bell-shaped flowers rise above the tansy-like foliage, making it a very attractive plant. It blooms continually for up to 5 months, from mid spring, providing nectar and pollen to foraging insects. This fast growing annual has a relatively shallow root system, and can also be used as a cover crop and green manure. An all-round star in the organic garden. For all its beauty, it is quite easy to grow – preferring a full sun position in sandy, rocky and light soils. A very giving plant for a “forgotten” corner. It’s disease free and drought tolerant, and does well in a mixed flower border or in the vegetable garden. Best grown from seed, the plant self-seeds freely. There was a time (16th century) that Tansy was given as an absolute necessity in the herb and food garden. These days, although it is still used as an insect repellent, it is not that common in household gardens. The name Golden Buttons that it is sometimes known by refers to the pretty flat-topped button-like yellow flowers that rise above the ferny foliage in summer. As an old edible plant (please note that it may have toxic effects if used in great quantities and is not generally advised for internal use these days) – it was used to flavour cakes, omelettes, and other foods, especially during Lenten. 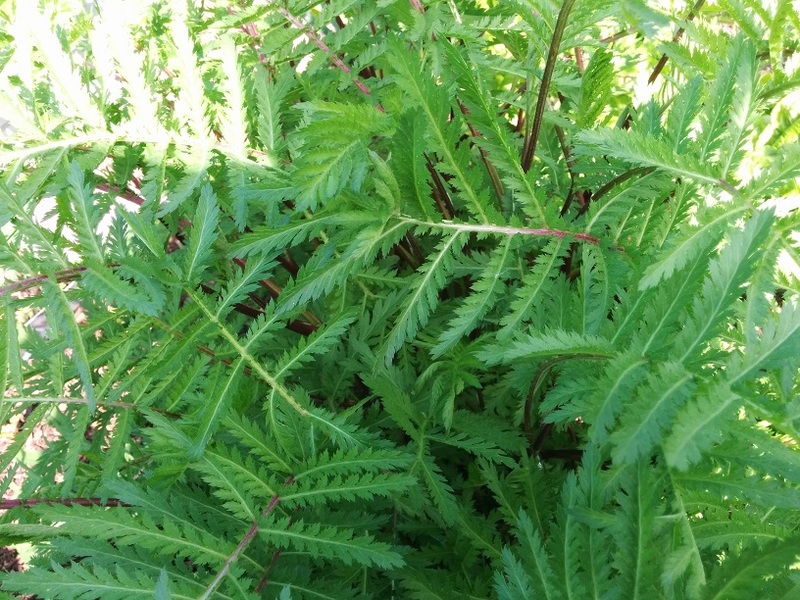 It very much used as a medicinal plant – strongly vermifuge and a common remedy for intestinal parasites, but also noted for fevers, rheumatism, failing digestion and open sores. It even had some cosmetic applications – a face wash of tansy is said to refresh and lighten skin. Quite effective to keep insects at bay – it was tested against mosquitoes and flies – it can be grown to repel pests in the garden, and dried, the leaves can be added to insect repellent sachets for the house. Tansy is a fast growing perennial, growing up to 1m tall, but spreading to over 1.5m. Grown easily from fresh seeds, or divisions at almost any time during the growing season. Be careful where you site your tansy as it spreads quite aggressively and is difficult to eradicate once well established. Tansy grows well in almost any soil, and prefers a full sun position and can tolerate wind. Almost time to harvest tomatoes! Tomatoes are one of my favourite fruits (vegetables) to grow. I am a bit of an heirloom tomato collector – my seed variety now over 100 different tomatoes – in every shape, colour and taste imaginable in the tomato world. 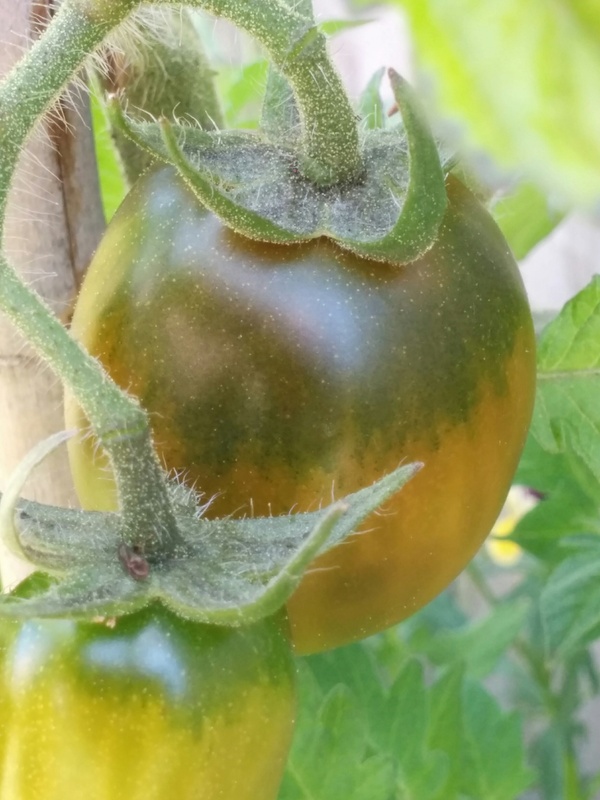 Here’s my top ten tips on growing optimal tomatoes.